Stock options are contracts with terms that can change prior to expiration. Mergers, acquisitions, special dividends and stock splits are some of the events that may necessitate the change in terms. 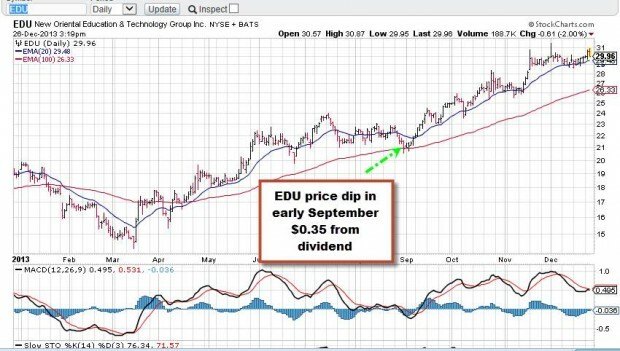 Since early September, New Orient Edu&Tech (EDU) has been on the Blue Collar Premium Stock List. In the middle of September I received several emails from members wondering what happened to the strike prices they sold. Several members had sold the $21 call options and wanted to buy them back prior to expiration but they no longer existed…They were gone! The price dip was partially due to the special dividend. When we see that a strike price we had previously sold no longer exists, it is usually due to an event that caused the Options Clearing Corporation (OCC) to change the terms of that option. The changes are made to make investors on both sides of that trade “whole” The best action to take is to call your broker or check the CBOE site or a similar one to learn the new parameters of the contract. For the week, the S&P 500 rose by 0.6%. BCI: This site retains its long-term bullish stance, currently favoring out-of-the-money strikes 2-to-1. The Weekly Report for 01-10-14 has been uploaded to the Premium Member website and is available for download. Synaptics Inc. is a leading innovator in touch technology for PCs, smartphones and notebooks and more recently with fingerprint authentication. Analysts were quite impressed with this company’s innovative elctronics last week at the Consumer Electronics Show in Las Vegas. As a results these analysts have been raising estimates and price targets. For helping me break attendance records at the Houston Chapter of AAII. Many traveled great distances (including from Nebraska!) to attend. Thank you! I’ll be returning to NY today and will catch up with emails by the weekend or early next week. Thursday January 16th is the last day to register for premium membership and get rates grandfathered into the current lower rates. Monthly membership will change from $29.95 to $39.95 and annual subscriptions will change accordingly. Current members do not need to take any action to get grandfathered into the lower rates.